Background: The brow bones are an important aesthetic feature of the male face. Some mild ‘protrusion’ of them, and the presence of a visible brow bone break, is an identifying and attractive male feature. But when the amount of brow bone protrusion becomes too strong or prominent it becomes a dominant facial feature that is viewed as distracting and causes an angry or mean looking face. The traditional treatment of excessive brow bone protrusion is brow bone reduction. For most men this means a bone flap setback method which must be done through either a coronal scalp or a horizontal forehead wrinkle incision. While very effective the scar tradeoff to do the operation must be considered very careful to avoid trading off one aesthetic problem for another one. 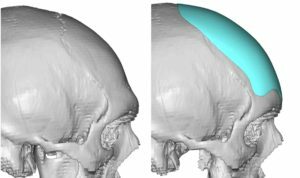 As some prominent brow bones in men are associated with backward slope to the forehead above it, an alternative approach to brow bone reduction is to augment the forehead above it. By filling in the forehead the degree of brow bone protrusion becomes less. In essence this is a form of pseudo brow bone reduction surgery. Computer imaging will help to determine if a forehead augmentation is a good alternative to actual brow bone reduction surgery. Case Study: This middle-aged male was bother by his prominent brow bones. With a significant concern for scalp scarring and searching for a less invasive treatment method, the consideration of augmenting the forehead above the brow bones was considered. Computer imaging looked at that option and it was determined to create an acceptable result. 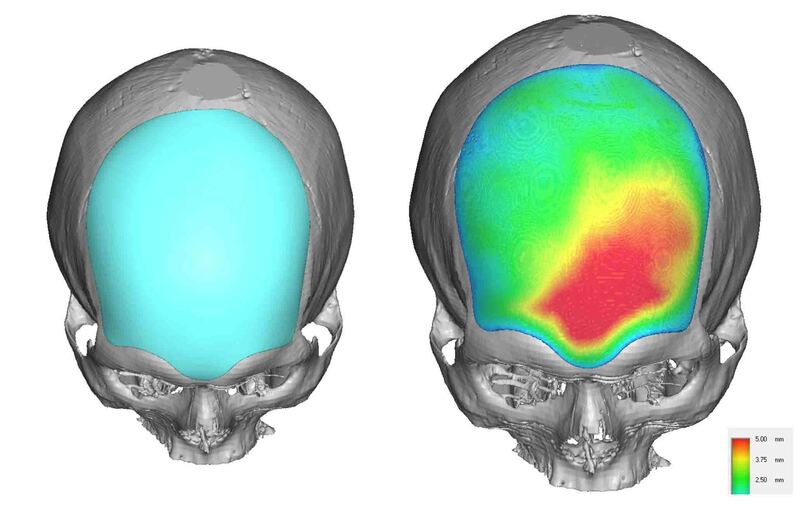 Using his 3D CT skull scan, a custom forehead implant was designed to fill in the ‘deficient’ forehead. The maximum thickness of the implant was 4mms. 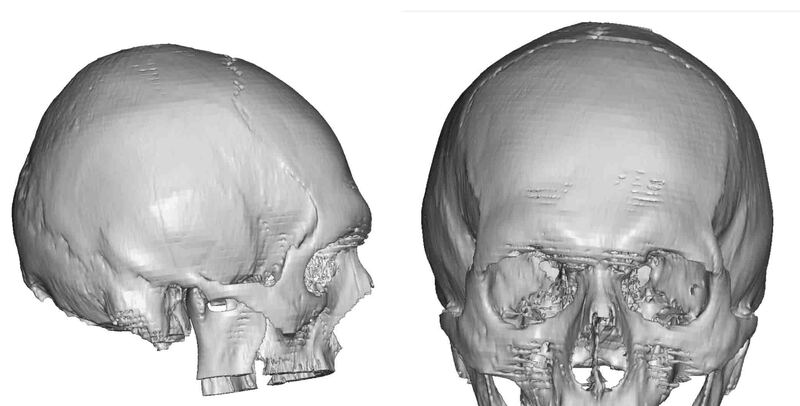 The computer was bone to pick up some bony asymmetry between the two sides of the forehead and automatically correct for it. Under general anesthesia and through a 5 cm scalp incision, a subperiosteal pocket over the forehead and down to the brow bones was created with the aid of an endoscope. The implant was then rolled, inserted and reopened once in the pocket to be properly positioned. The endoscope confirmed that all edges of the implant were unrolled and placed properly. Two microscrews were use for fixation of the implant at the location of the incision. His intraoperative result showed how the concept of forehead augmentation can be an effective brow bone reduction method. As long as the forehead implant is not too big it produces a natural result that bends in seamlessly. 1) Prominent brow bones can be treated by either brow bone reduction or fished augmentation above it. 2) Filling in the more retroclined forehead slope above the brow bones is a method of ‘pseudo’ brow bone reduction surgery. 3) A custom forehead implant offers the most accurate method of forehead augmentation though the smallest possible scalp incision.